Welcome back to the Artists of Color interview series. I’m beyond excited to share that this week’s interview is with none other than celebrated animation artist, illustrator and author, Armand Baltazar. I first discovered his work at San Diego Comic Con, and various other conventions a few years back, when Armand was first sharing concept art from his soon-to-be-published illustrated book series, Timeless. I was stunned to discover that he had also previously worked as a vis-dev/concept artist on a number of my favorite Pixar and Dreamworks films, and had only recently taken the leap into the world of creator-own projects. I’m honored and humbled that he took the time to participate in this interview series amidst his very busy schedule. Enjoy! My name is Armand Baltazar, I’m a first generation Filipino-American born in Chicago. My parents were Filipino immigrants who came to the US for opportunity and to make a good life for their family in the late 1960’s. I guess I would describe the person and work I create today as an Artist & Author. I fell into love with art and wanting to make it as a young boy. From as early as I can remember I loved having something in my hand to make images with. When I was very young, my mother would take me to the Art Institute of Chicago to see the art, children’s films, and attend kid art classes. Those experiences had a profound impact on me. I think as early as the 5th grade –– I knew that making art in some capacity was going to be the career for me. My parents were very supportive, but also concerned that I would starve as a fine artist. So they encouraged me to study something more commercial that they and the older generation of my family back in the Philippines could relate to…like advertising or graphic design. Ultimately everyone was on board with my choices, especially when they started to see the hard work and dedication I put in starting to pay off in my art. I was fortunate to have a strong art program in high school, and that is where my training began. Then I got more serious in college and studied advertising and editorial illustration, earning my first undergrad degree. After that, I got very serious and focused and attended the Art Center College of Design in Pasadena. I believe that training is vitally important, but that training is as much the experiences gained by the interactions of other students and artists, as it is in the knowledge that you accumulate. And honestly, as much as I learned in school and art school, I learned so much more working with professional artists and masters of their craft in the industry. 4). You recently published the first book in a series of sci-fi fantasy novels that you yourself wrote and fully illustrated, called Timeless: Diego and Rangers of the Vastlantic. Can you talk about your experiences developing your own IP after years of working in feature animation? What joys and challenges has this epic series presented for you as a creator? Growing up, I loved to read adventure, sci-fi, fantasy, and horror stories. I also loved comics, animation and movies. When I was a boy, I used to love to write and illustrate my own comics. My early passion for visual storytelling led me to focus on book illustration at Art Center. My work caught the attention of DreamWorks animation, and I began my professional career there. Years in the animation studios offered me the opportunity to work across multiple disciplines in film design and visual-story development. While working closely with both art and story at Pixar, my desire to create a story that encompassed both writing and art was reborn, and I began to write and illustrate a story for my son that would become Timeless. I love to create art and story for films, but the joy I found in doing that was multiplied ten times over when creating my own story and the artwork to bring it to life. It is both exhilarating, rewarding, and really hard work. You are your own harshest critic and demanding boss…but when it’s working, it’s amazing. You change as you grow and mature. Your values, and point of view constantly evolve. At different points in my career I’ve wanted specific tangible things…produce great work, attain a specific position, work at a successful studio, or with a specific director, etc. What I’ve found now and at this stage of what I do, I really want to be happy doing something worthwhile with my family, life, and work. I’m hoping that the stories and art that I create now can be both beautiful, entertaining, but also have something to say that hopefully makes a difference and makes the world a better place. Representation absolutely matters in art. Especially in these times and the challenges people of color continually must face both here in the US and abroad. It sickens me to see the growing divisiveness, hate, and intolerance seemingly growing. As an artist and as someone of color, I can use my artistry, stories, and talents to help highlight the best in all of us, and the best that can be fostered in the generations that come next. Representation in our art and as representative of what we can contribute to the world is an important part of that. It would be in finding the value in our shared human experiences, finding empathy, tolerance and courage. Courage to say something with your art that may stretch you beyond the norm and elevate us all to a better version of ourselves. Lately it’s been a toss up between Tessa Thompson’s Valkyrie and Donald Glover’s Lando Calrissian! These characters each deserve their own stand-alone films! Tessa Thompson as Valkyrie in Thor: Ragnarok (left), Donald Glover as Lando in Solo (right). My favorite film director at the moment is Taika Waititi, and I loved his work even before Thor Ragnarok…going back to his indie comedies like Hunt for the Wilderpeople. 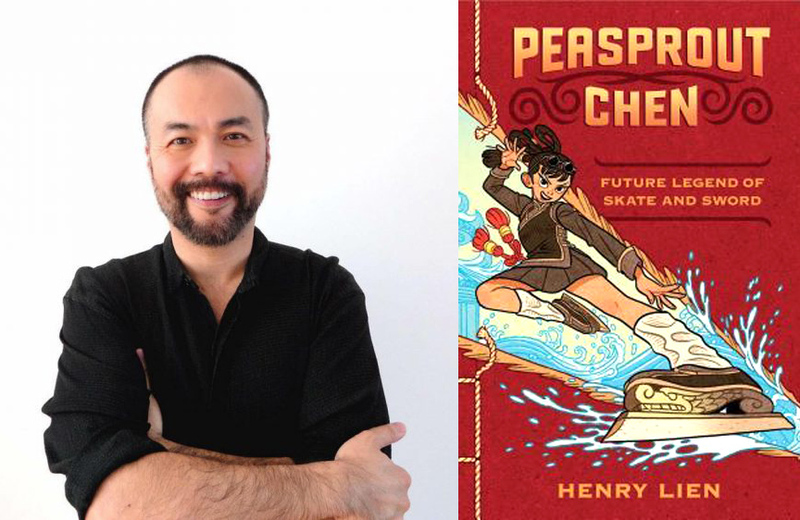 And I’m a huge fan of my friend Henry Lien, the author of the middle grade fantasy novel: Peasprout Chen: Future Legend of Skate and Sword! Taika Waititi. Thor:Ragnarok (2017), Hunt for the Wilderpeople (2016). Absolutely KNOW the value of who you are and the experiences and culture that make you who you are. Understand that that part of you gives your voice and vision power that is uniquely your own and can change the world in ways both big and small. I’m currently working on Timeless Book 2 and helping where I can with the folks who are developing a Timeless movie for Twentieth Century Fox. The dream project…I’m currently working on that now with the books and hopefully one day on the film adaption of my books! Thank you so much, Armand, for sharing your story and your gorgeous art with us! And thank you, readers, for joining us for this interview series. If Armand's answers resonated with you, please comment and share his interview far and wide.